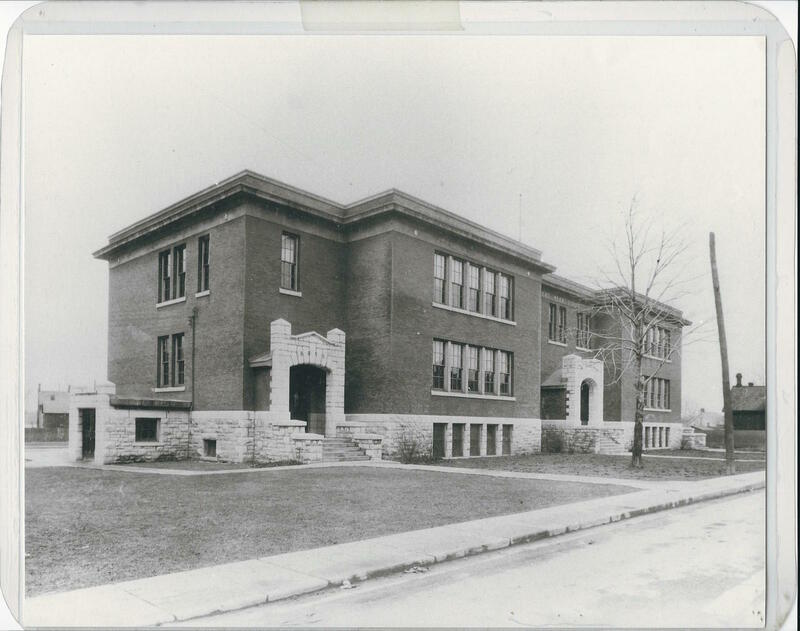 A photo of Robert Meek School depicting the infamous separate boys and girls entrances. Courtesy of the Frontenac County Schools Museum. A couple of weeks ago, I visited the Frontenac County Schools Museum in Barriefield with hopes of finding information on the history of the schools in the Swamp Ward. Initially planning on spending an hour at the museum, I ended up staying the entire morning going through materials on Robert Meek School. The museum houses toys and books that look like they’ve received a lot of love and attention over the years. There is also a staged Anne of Green Gables era classroom — complete with well-used desks and slates from a one-room schoolhouse. Surrounded by the museum artifacts as inspiration and aided by Board of Education minutes from 1921, when the school board approved the purchase of a piano and decided on paint colours, an image of Robert Meek School formed in my mind. However, what really brought the school to life was becoming familiar with the people who filled its halls every day — the teachers and students. Booklets held together by construction paper and butterfly clips, made by Mr. Grant’s Grade Seven class, have been filled with typed poems about anything from Christmas to sunsets. The booklet is not dated, but a student’s poem about the death of John F. Kennedy suggests it was created in the early 60s. While the poetry by Mr. Grant’s class made me feel familiar with some Robert Meek students, I felt that I was getting a truly exclusive look into the school through the scrapbook of Miss Kathryn Baker, a Grade Two teacher at the school in 1943. Miss Baker’s scrapbook is thick with pasted-in clippings from The Whig Standard about World War II and sailboat races, personal letters from friends overseas, and notes from parents explaining their children’s absences from school. Seeing the snippets of Miss Baker’s life was an intimate experience, but it also left me wondering what the scrapbook meant to her and why she chose to keep the things she did. I’m looking forward to learning more about Robert Meek School. If you have any information or would like to speak to us about Robert Meek School please contact me. I would very much appreciate any photos of Robert Meek School, especially, those that show more of the house next door, (in the far right of the above photo). My husband & I, have owned that house for just over a decade. We have often wondered the history of our home. This is the only photo I’ve ever seen, that doesn’t include the rear addition of our home. We wonder what year the back of our house was built, & it would be interesting to hear stories about the former residents of our home. This is a great site…I love learning some history of our neighbourhood. Thanks! As stated in the reply to Wayne Huff, we are thinking of running a workshop on “Researching Kingston History” — maybe you’d be interested in coming — we could surely help you find some answers to your questions. My old school..lots of memories 1947 to 1953…my three older brothers and 1 sister went there also….lived on bagot street by raglan road. Good old swamp ward. Great place to live. I went to Robert Meek from 1970- 1976, it was a great school and a great area to live in. My grandparents had live in that area on Montreal st since the 1930’s. Hi Dave. Would you be interested in doing an interview with us this summer? We’re always looking for new stories. A great beginning to school life . 1941 to 1949 were memorable, formative years with mentors and guides like Miss Day , Mrs Swerdfiger, asst principal, Mr. Darling and Principal, Mr. Eccles . Morning ritual was to sit ‘up the stairs’ , and sing , God Save The King, followed by,’The Maple Leaf Forever’ with gusto and pledge to do our best effort to raise money for VICTORY Bonds . We were reminded to collect milk weed pods so the seeds from the pods could be used as stuffing for Navy life jackets and salvage any metals we found ,( or ‘acquired ‘ from the back of Rosen’s Scrap Yard on Cataraqui St. so they could be converted for other war use. In summer, the ball teams practised on the ball park/ playground. In winter , boards were put up , the area flooded and that same playground became a hockey/skating rink. Hi. My grandfather and Great grandfather, Ron Wallace and Robert Wallace of Wallace and Son built Robert Meek School. They were builders and stone masons as well as stone cutters. They had three quarries in Kingston including one that streetches behind St Patrick’s School a,d alone Patrick Street towards James and Pine streets. Robert Wallace lived on Patrick Street in a house where I spent the first five years of my life.